Toronto indie pop darlings Hooded Fang only dropped their album Tosta Mista a few months ago, but drummer D. Alex Meeks has already announced plans to release a solo album of his own. 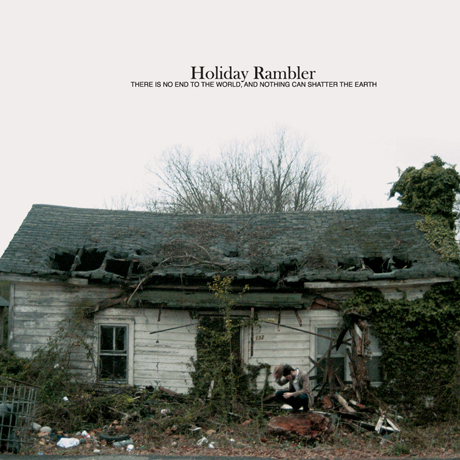 Using the moniker Holiday Rambler, he will drop There Is No End to the World, and Nothing Can Shatter the Earth on February 14 via the Quality Co. division Deceitful Ear Recordings. A press release promises that the album contains "folk songs entrenched in the spirit of the American South." Lofty themes like "religion, family, and the future of the world" are paired with "the simplicity of an acoustic guitar." Based on the description at Bandcamp, it appears that this album was recorded in a single day (January 6) by A. Unger and E. Clancy. Get a dose of the album's stripped-down sound in the form of "Dogwood," a bluesy folk track that showcases Meeks's nimble finger-picking and religiously minded lyrics. The clip that accompanies the single is fittingly rustic, as it shows forests, train tracks and largely abandoned wooden structures. Scroll past the tracklist below to watch the video and check out the album cover above. Dogwood from Quality Co. on Vimeo.